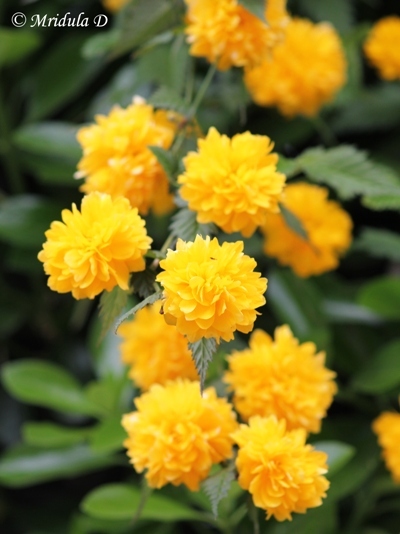 I am very fond of clicking flowers, though recently it does not reflect in my posts. So I am going to correct it. Today I am going to post a bunch of flowers all clicked around Jagatsukh. And I have enough flowers for 2-3 weeks and that is without rummaging my folders! When we took an auto from Manali to Jagatsukh I had spotted this vine then itself. I knew I was going to walk that way just to click this picture. I tried very hard to identify this but could not find the name. I have been lucky with every other flower in this post but not this one. So if you know the name do drop in a comment. 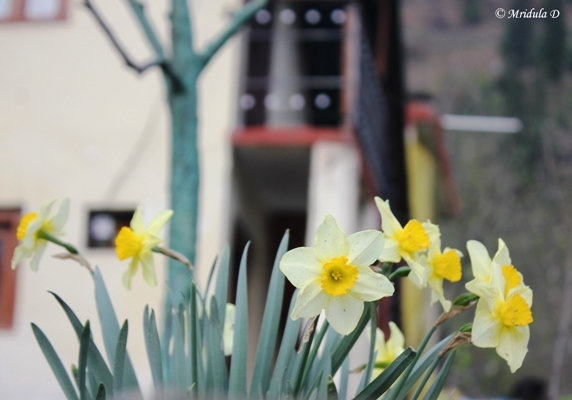 Then while walking back from my waterfall I spotted these Daffodils growing in a pot close to the wall of a house. Now I rarely get to see them in the northern plains so I had to stop and click. Till date none of the house owners have objected to me clicking flowers but their dogs are another matter! 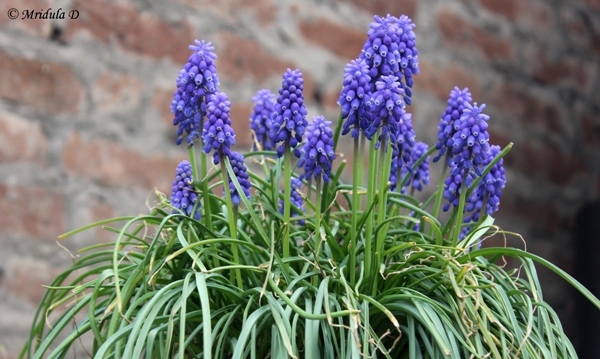 Then a little later I saw two pots full of Grape Hyacinths and I climbed on a road side barrier to get closer to them. A granny from the house came out, smiled at me when she saw I was clicking her flowers. I id all these flowers using Flowers of India website. After getting a probable match I do a Google search to get more images and confirm my id. 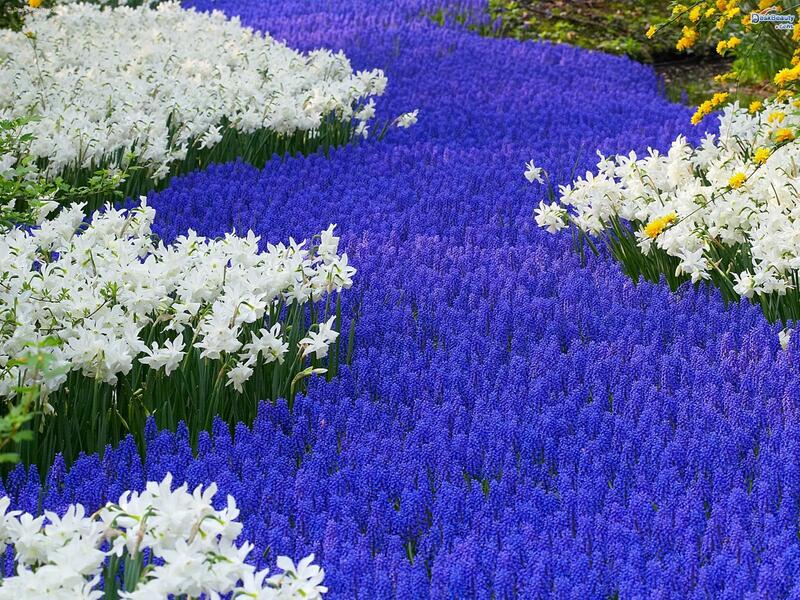 During my search I was floored by this picture of Grape Hyacinths. 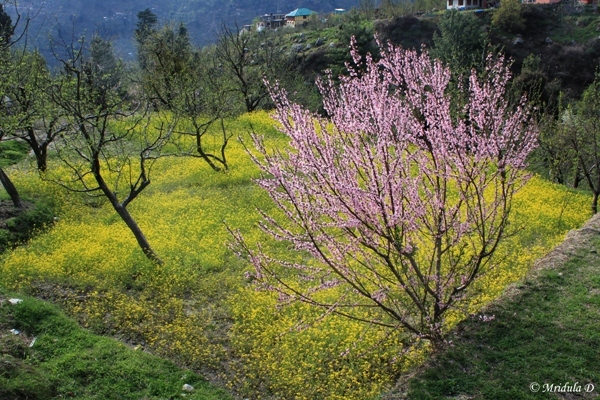 I saw these while I was walking in another direction, towards Kakhnal which is a small village towards Naggar. 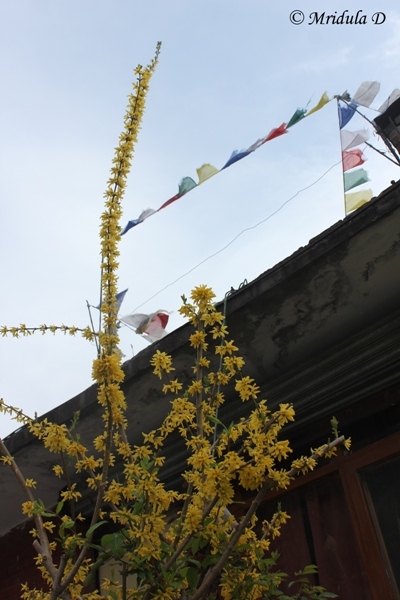 These lovely yellow Kerria Doubles were overflowing over a wall. After this point I once again turned back to sit down at a dhaba to have a cup of tea and then walk back to Jagatsukh. But I think this Apricot tree in a mustard field was my most impressive sighting. This was once again on the walk towards Kakhnal. This field was quite close to Jagatsukh market once I crossed the bridge over the river. It is such a pleasure to walk around in Spring!